Are you ready for the next level of crazy? I’ll be interviewed by Joshua P. Warren on Speaking of Strange and you’ll discover the story behind George Washington’s ghost and so much more! You’re going to be hearing about this one so be the first to find out about this crazy new paranormal tale! I told you the presidents weren’t happy and now it’s official. I knew it was real, since I took it, but now the experts agree with me. Joshua P. Warren is the host of a syndicated weekly paranormal program, Speaking of Strange, and he is regarded as “one of the great paranormal investigators of all time” by George Noory, host of Coast to Coast AM. 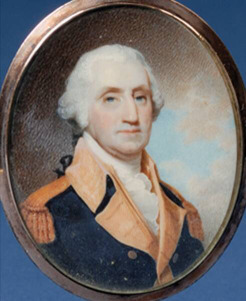 I sent the photo of George Washington to Mr. Warren and his team of experts did their best to prove that this was not a picture of a ghost. 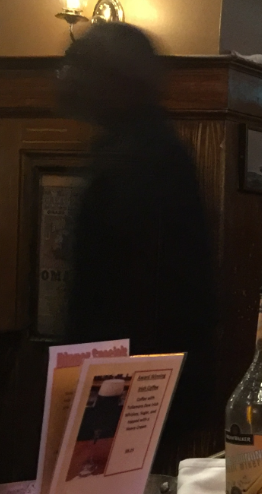 They took it apart, pixel by pixel, and after an extremely thorough examination, they decided that this was an authentic photo of a ghost. Mr. Warren is even planning a visit to the tavern where the photo was taken and I have no doubt that the presidents will be there with us. It gives validation to what I’ve been saying. The presidents are upset and they’ve come forward to be heard, and to be seen. They are crying out for you to hear what they have to say. They may be on the Other Side, but they retain their love and passion for the United States and they have more than a few choice words about what we’ve done with it. They want you to hear their words before you cast your vote. Stay tuned! It won’t be long now. This is Dwight. He’s the ghost we brought home for Christmas. His name is Dowaito, but I call him Dwight. It makes it easier for me to talk to him, and he doesn’t mind. My husband received a WWII Japanese Arisaka rifle as a Christmas present. I only caught a quick glimpse of the gift during the flurry of holiday festivities, and I had forgotten about it, until I sensed an extra passenger when returning home on Christmas night. I as I listened to a screaming Dwight behind me in the car, I asked my husband to tell me the story about the rifle. The Arisaka Type 38 rifle belonged to a Japanese soldier in WWII. This rifle is unique because the Chrysanthemum Flower Seal, stamped on the top of the receiver, is intact. I chose the picture of the Japanese soldier (above) because he looks like Dwight. 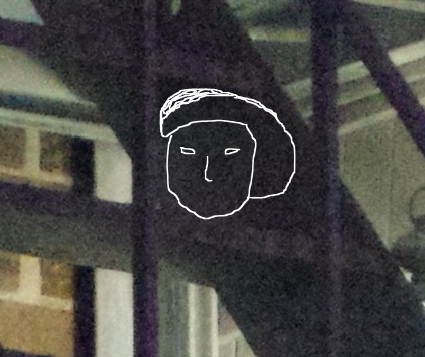 A face appeared in a reflection in one of the photos I took of the rifle. The eyes in the photo appear overly large, but later when I searched for a Japanese solider image, I realized that the large eyes could be glasses. Dwight was used to yelling a lot because no one has listened to him for a very long time. Thankfully, the fates brought him to me so I can help him find his way home. I thought the story ended here, but Dwight wasn’t finished with me yet. He knew I was listening, so he invited his former comrades to raise their voices. In family discussions about the rifle, I learned that my husband’s brother (the gun owner before he gifted it), also has in his possession a Japanese Good Luck flag, complete with blood stains. A wallet with Japanese family photos was acquired with the flag during WWII. When a door to the Other Side is opened, multiple Spirits may use it. Thats’s exactly what happened with these Japanese soldiers and it’s why I wrote, Presidential Souls, about all of the U.S. presidents who came forward to deliver their messages. The Moral to this story is: If you took home any antique gifts this holiday season, be aware that you may have been gifted with some extra special Christmas Spirits! For centuries, there have been reports of possessed people, cursed or haunted houses, which I have covered a lot of in my stories. I have also wrote about cursed dolls, but I am now going to tell you about some famous haunted, cursed, & possessed objects with some real documented video footage & photographs. 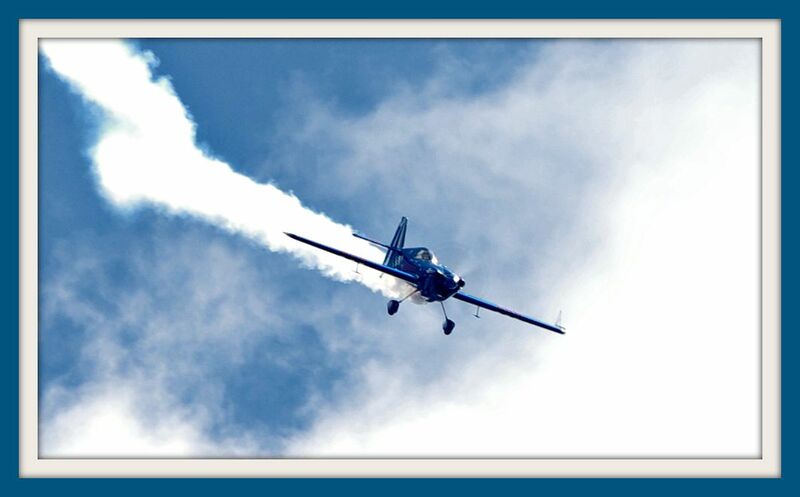 Spirits love to attend special events, but I never expected to see them at the Air Show. 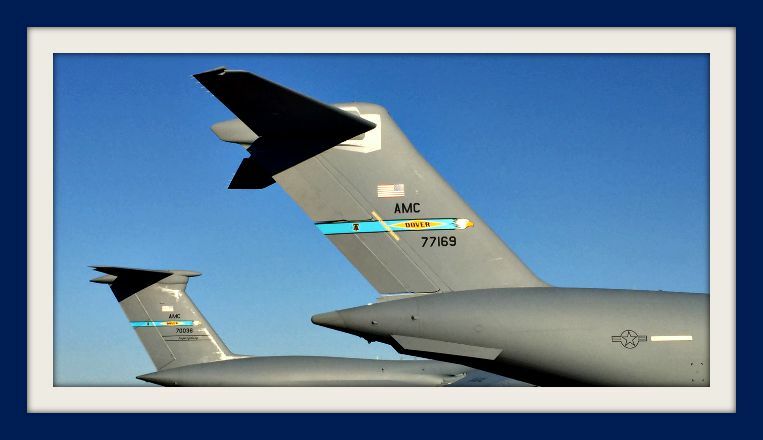 The Spirits surprised me with their presence at the 2015 Joint Base Andrews Air Show at Andrews Air Force Base. Jolly Spirits laughed and waved their arms in glee while hanging out on top of the huge cargo planes by Hangar Two. The giant planes possess a high Spirit attachment, but no sadness surrounded them on this day. The Spirits eagerly anticipated the air show and their joy was contagious. Besides the happy Ghosts on the cargo planes, I received two additional unexpected visitors. 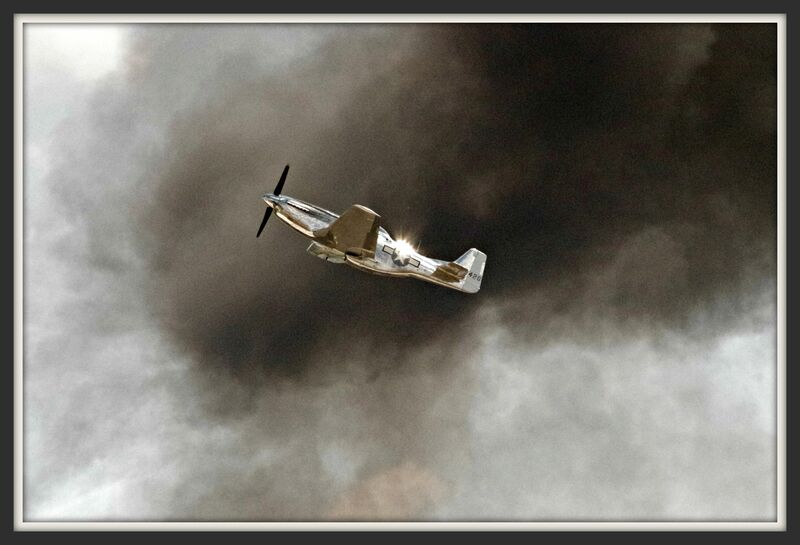 Sid, my late father-in-law, appeared as I watched the World War II airplanes flying in the show. Sid was a retired Air Force Colonel and he began his career as a pilot on the airfield during the attack on Pearl Harbor. Sid has been gone for many years and I gratefully accepted his visit and reminder of his service. He truly enjoyed watching the show. The other ghostly attendee may be surprising to some, but due to information I recently received, it wasn’t a surprise to me. I’ve been working with General Dwight D. Eisenhower and I’ve written a chapter about him in my book, Presidential Souls. I know the secret as to why he was in attendance at the Air Show, which is revealed in the book. Despite being sunburned, hot and tired of waiting in the long bus line after the show, the smiling Spirits kept me entertained. They continued to party, perched on the giant planes, as they cheerfully waved goodbye. The Air Show was a day to be remembered. Be comforted in knowing that your friends, loved-ones and fallen comrades were with you. They proudly watched the incredible Air Show and participated by cheering, waving and standing by your side. 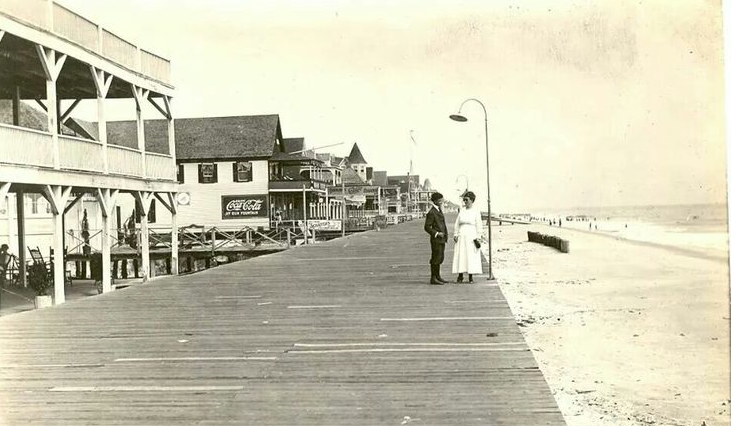 Robby and I recently went on the Ocean City Ghost Walk, where we were introduced to more than a few Spirits who still love to hang out at the beach. Robby took pictures during the tour and I pointed out highlights when I “felt” the Spirits. 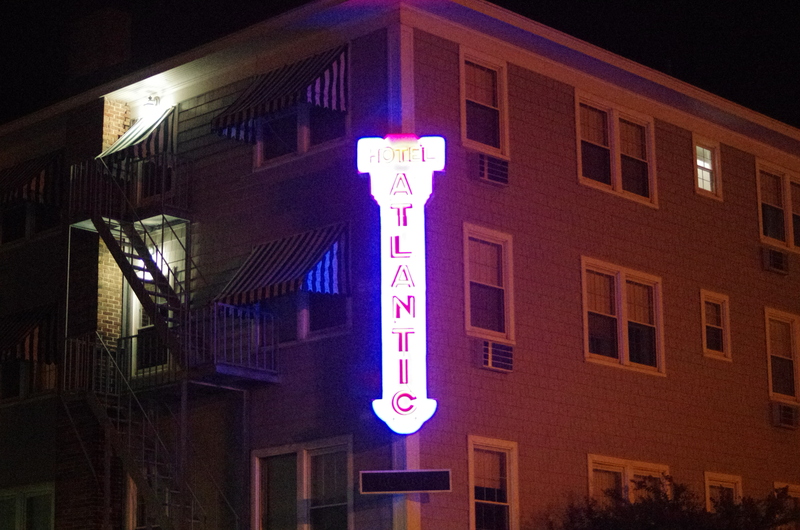 We were lucky enough to capture two Spirits in one of Ocean City’s most notorious haunts – the Atlantic Hotel. Dr. Charles Purnell is the principle Ghost-in-Residence at the Atlantic Hotel, but I believe there is also a woman hanging out with him. 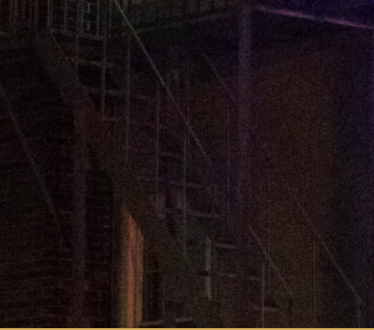 As soon as we approached the hotel, I told Robby I sensed a strong presence on the outside fire-escape stairs. He took pictures and we captured shots of a man and a woman in an old-fashioned bonnet. The pictures are not clear and easier to view from the original source, so I included outlines to point out the Spirits. The photos, though hard to see, back up the strong projected presence before we entered the hotel. The Spirit in this picture could be Dr. Purnell. A man is walking up the stairs with his back is to us. He is not wearing a hat and I can make out a coat-sleeve and pants. Dr. Purnell is no doubt getting in place to prepare for our visit in his hotel. 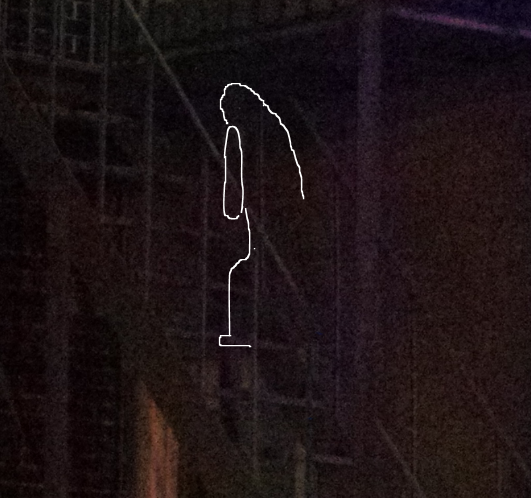 This woman is on the same outside stairs. 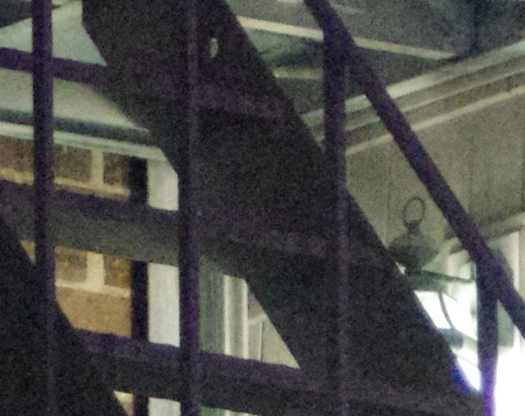 I probably sensed such a strong presence on the fire-escape because there were two Spirits. I can only make out the head of the woman, but she’s wearing an old-fashioned bonnet with a wide brim. 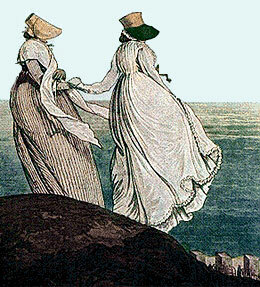 Perhaps she remains by the ocean, like the ladies pictured below, because she wants the blissful times at the Atlantic Hotel to continue forever. During the tour we learned about Joanne Trimper and the Ocean City Trimper Carousel. 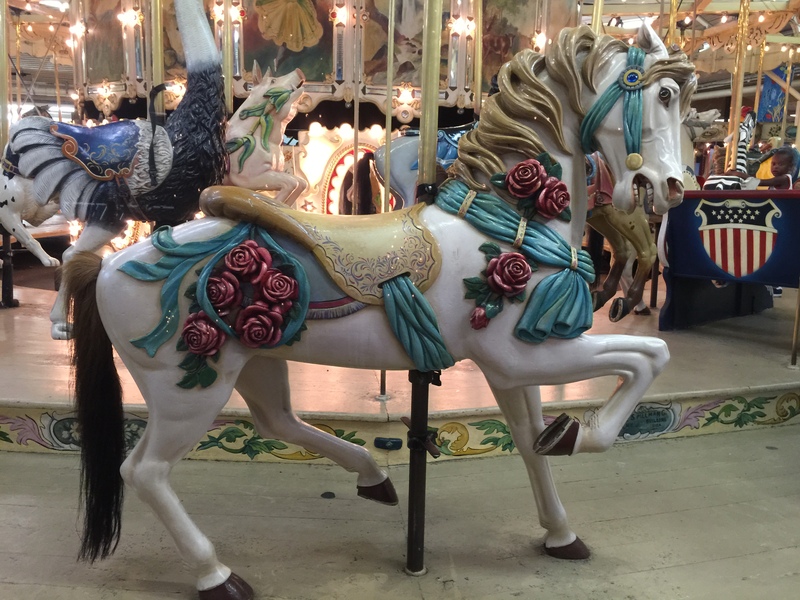 The carousel is the oldest continuously operating carousel in the United States and Joanne loves it so much that she still remains by her favorite Carousel Horse. 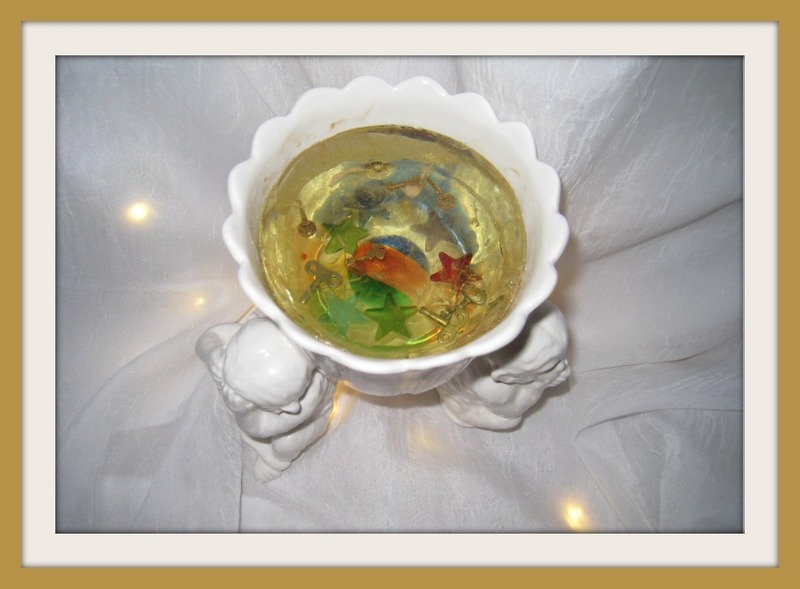 We learned that Joanne’s perfume scent, “Cristal”, lingers near her Carousel Horse, so we returned the next night to check it out. Robby rode Joanne’s Carousel Horse and when he asked Joanne for a sign that she was near, a sweet scent momentarily drifted past him. Unfortunately, I have no sense of smell so I couldn’t experience the phenomenon, but the look on Robby’s face was genuine shock and surprise when he got the confirmation that he asked for. Robby described the multitude of aromatic scents surrounding the Carousel and he said there was no one near us with anything resembling the sweet perfume. He said it happened in an instant – as if Joanne walked past him from the front of the horse to the back of the horse and continued past him, after which, the amusement park aromas returned without a trace of Joanne’s perfume. Suspiciously fast, the perfume scent was there one second and gone the next. Robby was rewarded for riding Joanne’s Horse, even when the ride attendant warned him that Joanne’s Horse didn’t go up and down. I’ll never forget Robby’s face when Joanne walked between us. It was a ride I’ll never forget. 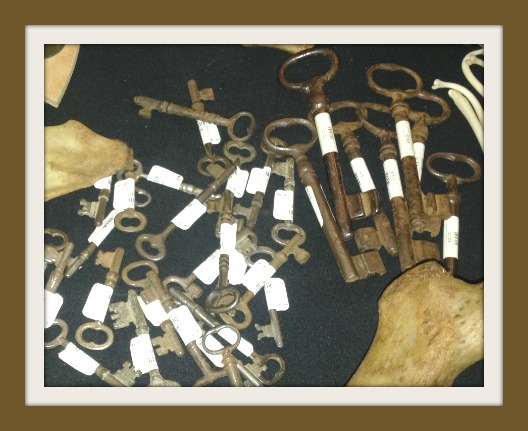 …Haunted Keys, Demons and a Séance! 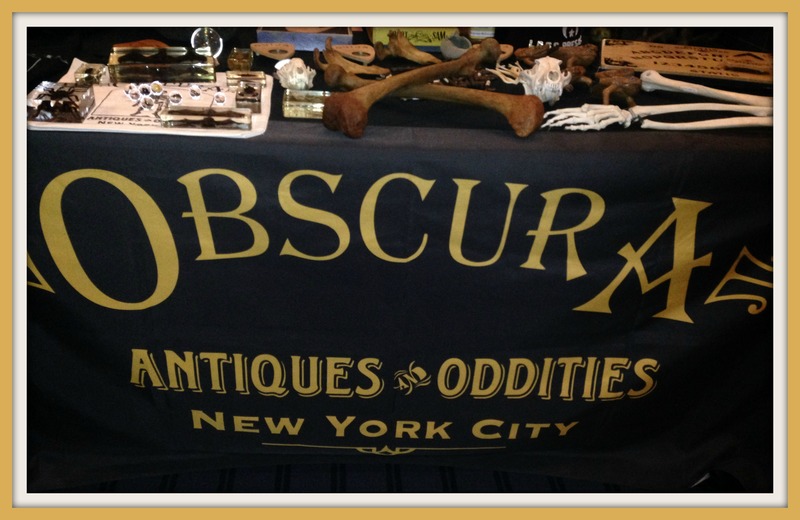 I don’t work with the Ouija Board, so there was much to learn from the lectures, vendors and museum. A vendor from Obscura Antiques and Oddities had a collection of old keys and as I conversed with the owner, the keys kept bothering me. I felt compelled to say something, so I told the gentleman about the powerful energy emanating from the keys. As I strolled about the convention, I was approached by a Danish researcher and asked to participate in a Ouija Board eye-tracking study. After I was hooked up to the equipment with another volunteer, we proceeded to ask the Ouija Board questions for the study. We found out about the Ouija Demon. During the session, the planchette kept spelling “A,Z,A,Z,A,Z”. It didn’t make sense to us, being Ouija novices, but at the conclusion of the session, the researcher told us about the Demon Zaza or Zozo. The evening ended with a séance guided by Chip Coffey. About a hundred of us formed a circle and joined hands in an attempt to channel the creator of the Ouija name. The origin of the Ouija name is a mystery to this day. but I had a visitor. Edgar Allan Poe is buried in Baltimore, but I hadn’t been thinking about him and I’ve never been to his grave. He came through to me as soon as the séance began and he told me that the Spirit (or Entity) who gave him his dark stories, was the same Spirit who invented the Ouija Board and was the creator of the Ouija name. I withheld this information from the group because I wanted to do some research before drawing any conclusions. then moved on to create the Ouija Board. The timeline fits with the information I was given. 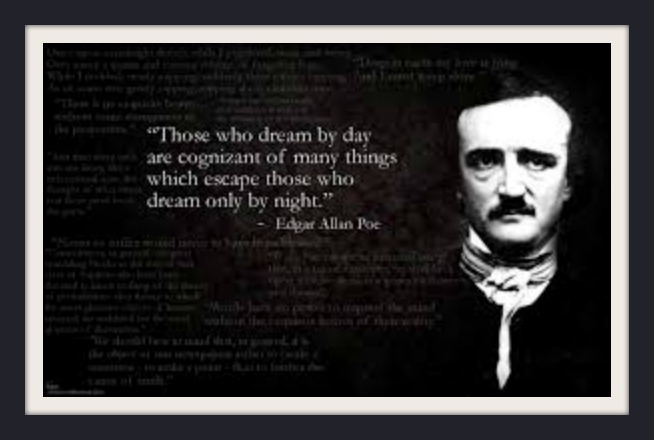 Perhaps that’s why Edgar Allan Poe and the Ouija Board both have Baltimore in common. Even more chilling was the fact that the séance was held less than half a mile from Edgar Allan Poe’s gravesite! 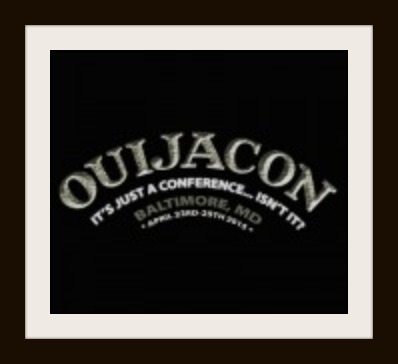 I didn’t know where it was before OuijaCon, but I know now. The events of the evening certainly gave me food for thought and made for a momentous initiation into the World of Ouija! The Spirits Speak and They Say: “No Candy”! I guess it’s not their fault. 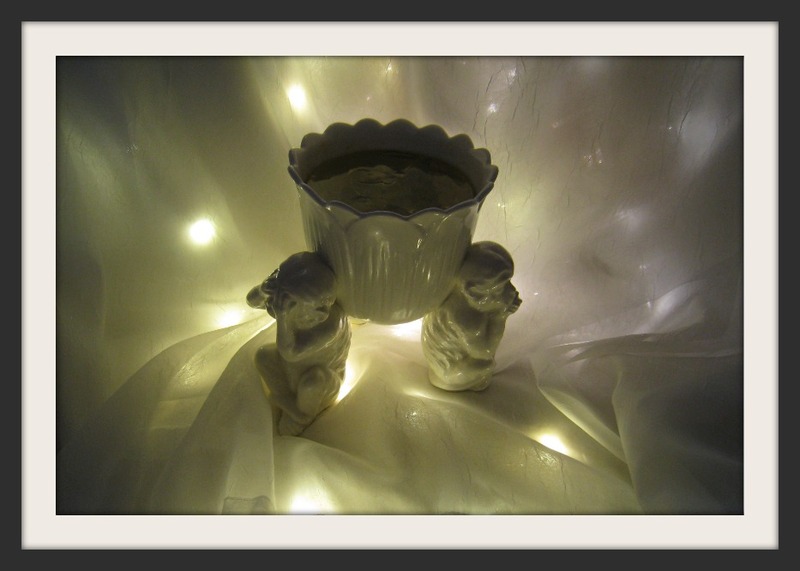 I had a few decorative items from my daughter’s wedding, but now they had no purpose. I decided to try working with resin, so I re-purposed them and made three Spirit Boards. Well, actually they’re Spirit Trays and a Spirit Vase. 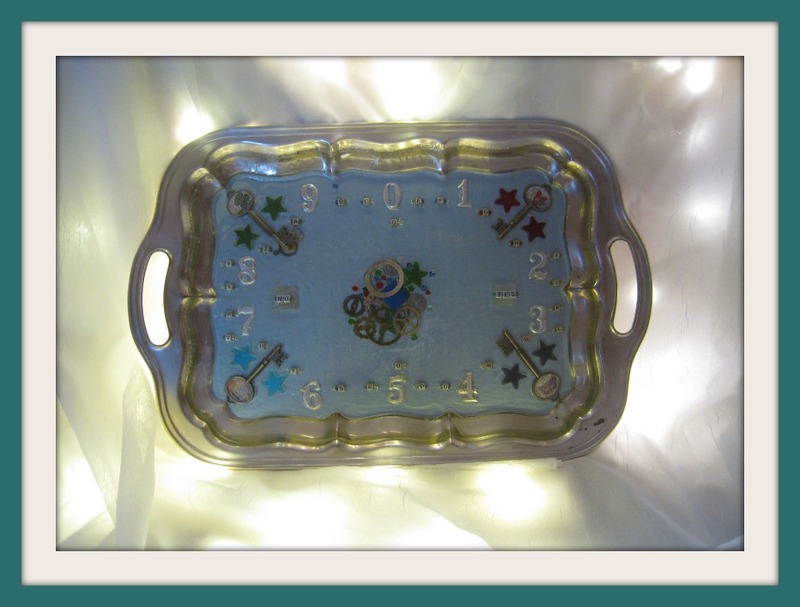 Two are made from old silver trays. They both have “Yes” and “No” and the alphabet, and the blue tray has numbers. 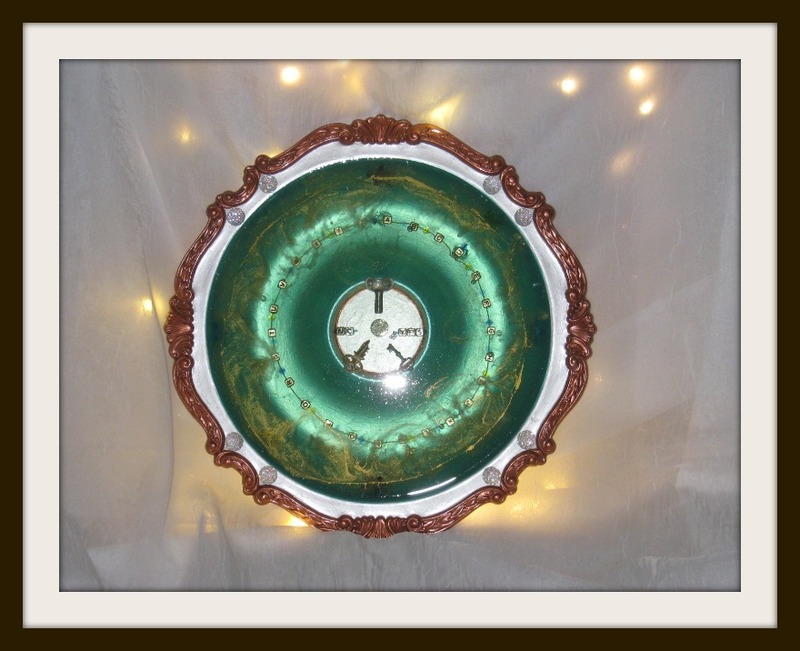 This one is made from a crazy vase that my grandmother gave me. It has three monkeys: Hear No Evil, Speak No Evil and See No Evil. I turned it into a Spirit Vase with a Dragon Eye center. After I finished, I decided to try them out. I work with a pendulum regularly, but usually I ask yes or no questions. The holidays did their usual damage and I needed to lose a few pounds. I keep a bowl of candy on the kitchen table and every night I’d have a piece or two. Just leftover Christmas candy. Hardly significant. I guess it was time to give up the candy.